Showing 40 articles from September 6, 2017. FRANKLIN COUNTY -- Three people died of gunshot wounds over the Labor Day Weekend; one the result of a more-than-week-old shooting in Pilot and two others during a double killing in Franklinton. 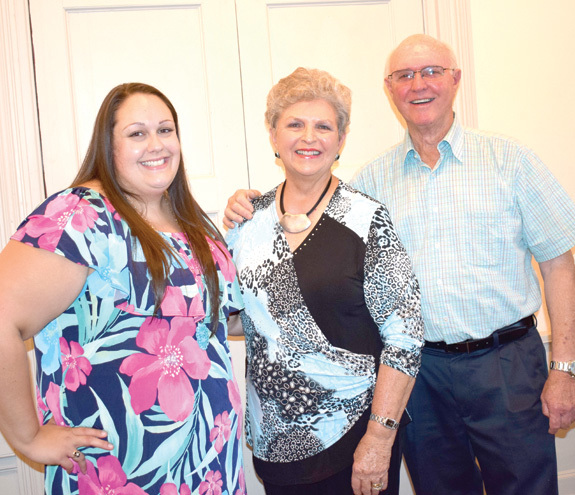 LOUISBURG -- If you've been around Franklin County for any amount of time, chances are you've crossed paths with Linda Cottrell of Louisburg. Perhaps it was at her family's business, Rustic Building Supply, before her retirement. Perhaps it was at the Franklin County Historic Homes tour; or at some event at the Person Place; maybe it was at her church, Louisburg United Methodist; or maybe it was at some other function or activity in the community -- although she's not always "out front" and visible. LOUISBURG -- Franklin County airport officials and aviation enthusiasts are set to honor one of the guiding forces behind the county's airport and aviation in general. Billy Lumpkin served as chair of the Franklin County Airport Study Committee, where his efforts were key in securing the federal funds and the site needed to build the airport, which is now Triangle North Executive Airport. This year marks the 100th anniversary of our country's entry into World War I, the "Great War." To commemorate this momentous event, the Tar River Center for History and Culture at Louisburg College is sponsoring a four-part lecture series, North Carolina and the Great War. Now in its fifth year, the TRCHC's lecture series brings scholars and citizens together to explore the history of North Carolina and the Upper Tar River region. Davy Crockett's motto would benefit us today! Many of us of a certain age grew up squinting at black and white television sets, captivated by the adventures of Davy Crockett, most often seen wearing a raccoon-skin hat and carrying a long, black powder rifle through the woods and facing all manner of challenges. 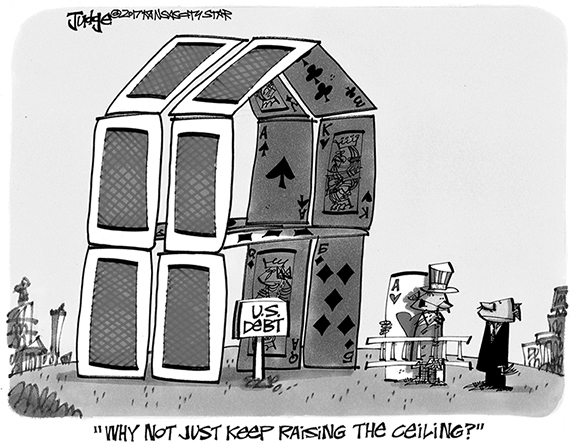 But old Davy's mantra was always "be always sure you are right - then go ahead." Simple advice from the "King of the Wild Frontier," although figuring out "right" isn't always as simple as surviving in the wilderness. It's a shame that it takes a tragedy of almost unimaginable proportions to bring out the best America has to offer -- but more often than not, that's exactly what it takes. 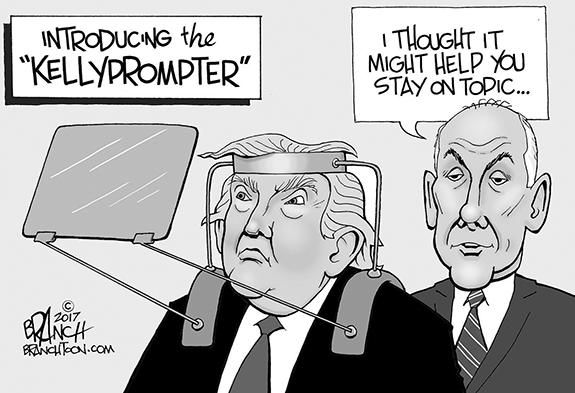 The last several days have offered countless examples of the American spirit -- and the willingness to reach out and help others, sometimes even at great personal risk. In a very real way, this weekend in Franklin County will be about inspirations. First, Franklin County's aviation community will take a moment on Saturday morning to recognize Billy Lumpkin, who played an instrumental role in establishing the county's airport, which is now Triangle North Franklin. It was with interest that I read about the Early College High School success story in a recent week's Franklin Times editorial page column (8/24/17). However, my first reaction was: What is the Early College High School? FRANKLINTON-- Douglas Earl Wood, 71, died Thursday, Aug. 31, 2017. A celebration of life service was held Monday, Sept. 4, at Union View Baptist Church, Franklinton. Burial was in Fairview Cemetery. BUNN - Eugene Dunn, 83, died Monday, Sept. 4, 2017. Arrangements by William Toney's Funeral Home, Zebulon. HOUSE RULES. 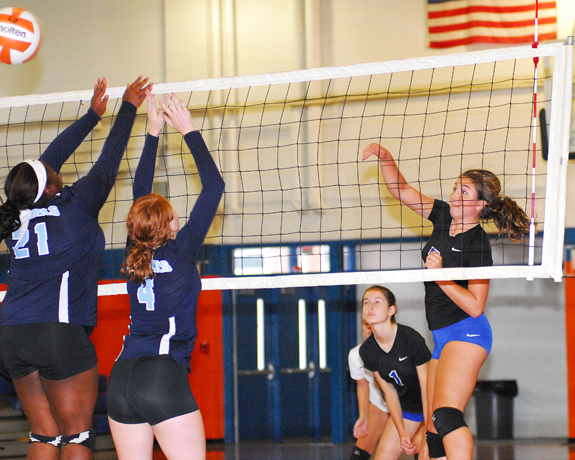 Louisburg's Kristen House (right) delivers a kill during last Thursday's home volleyball triumph against league foe Southern Vance. LOUISBURG -- Louisburg High School's volleyball team is approaching a very special anniversary. It's been almost two years -- September 17 of 2015 to be exact -- since the Lady Warriors were defeated in a regular season match. 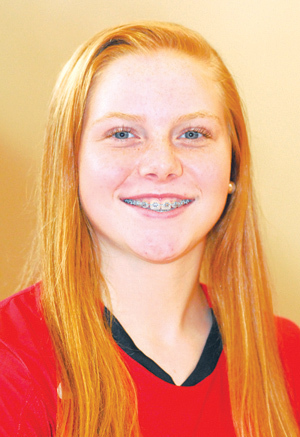 The amazing streak continued Tuesday as Louisburg topped new Northern Carolina Conference opponent Oxford Webb in four sets at the LHS Gymnasium. AROUND END. Franklinton High School's Raven Cardwell (with ball) picks up yardage for the Red Rams during last Thursday night's road victory against county rival Louisburg at Patterson Field. GETTING STRETCHED OUT. 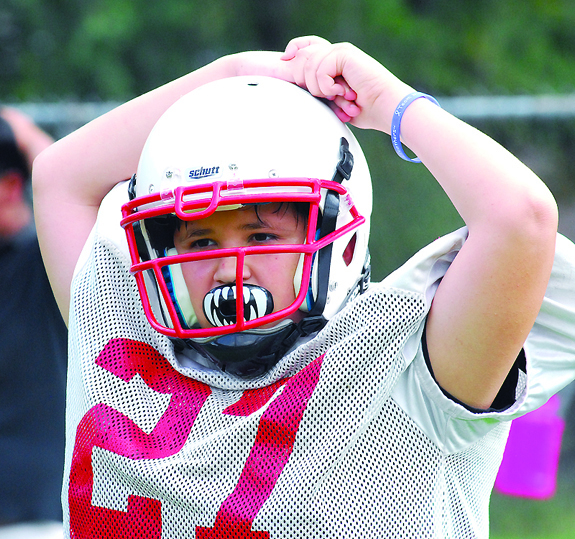 Franklinton Middle School's Austin Harris warms up before recent football practice. FRANKLINTON -- As he gathered around a circle of 20 youngsters Monday, it was safe to stay that Lester Wilder probably coached some of the parents of the children he was addressing. And maybe even some of their grandparents. 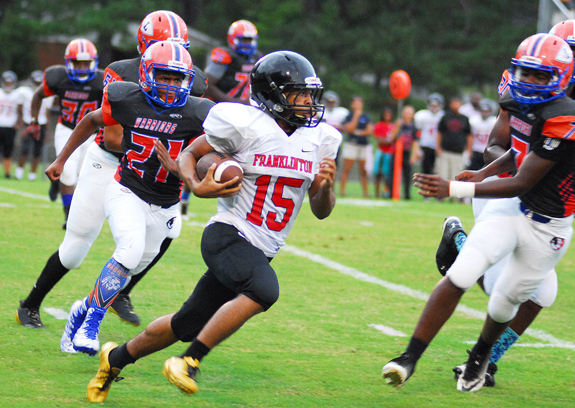 The undefeated powerhouse Firebirds had no problem with visiting Bunn last Thursday, rolling to a 55-7 non-conference decision at Firebird Stadium on the SNHS campus. 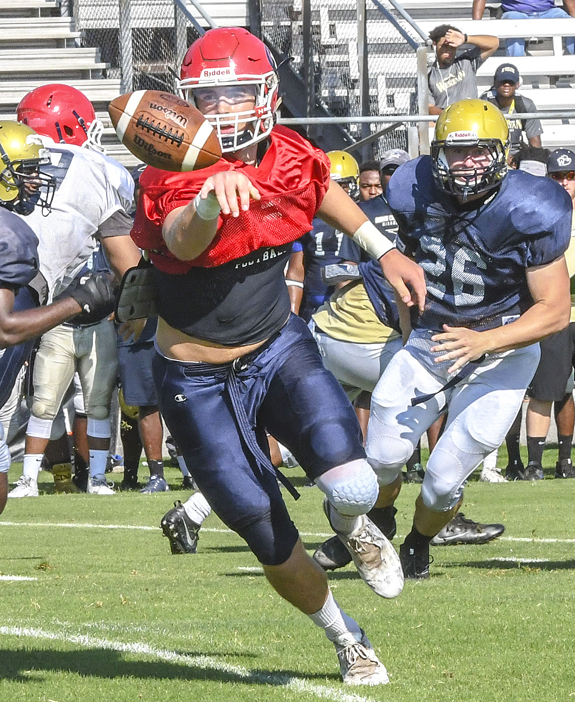 MYRTLE BEACH, S.C. -- Louisburg College's football team continues to pile up the points on offense to go with a stingy defense. 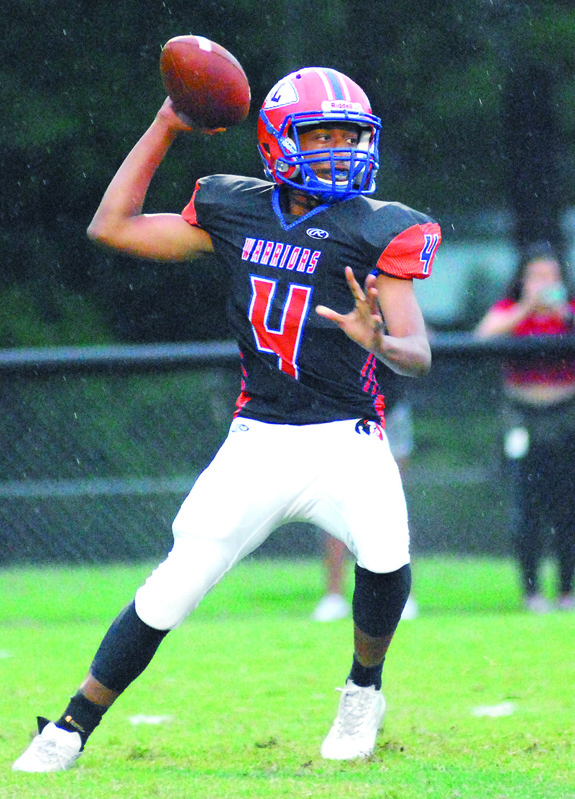 LC is now 2-0 on the football campaign after a victory last weekend against Southern Sports Academy in a contest that was played at Doug Shaw Stadium along the Grand Strand in the Palmetto State. HAVING A BALL. 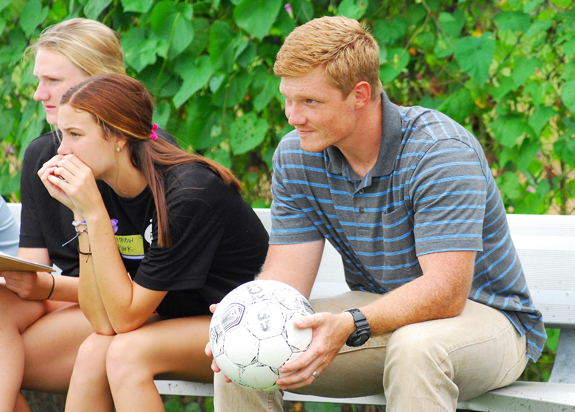 Franklin County native David Pearce is in his first season as an assistant varsity and head junior varsity soccer coach at D.H. Conley HS in Pitt County. FRANKLIN COUNTY -- Even though he majored in marketing at East Carolina University, the thought of being a soccer coach never strayed too far from David Pearce's mind. Pearce, a 2011 graduate of Louisburg High School, had coached rec soccer before, but had longed to test his skills at a higher level. ZEBULON -- The homestanding Carolina Mudcats closed out the 2017 season with a seven-game winning streak after defeating the Pelicans 3-1 in Monday's Class A Carolina League baseball season finale at Five County Stadium. Max McDowell hit a solo home run and both Monte Harrison and Weston Wilson had run scoring hits in the sweep-clinching victory for the Mudcats in Zebulon. LOUISBURG -- Louisburg College has finalized its all-sports coaching staff for the 2017-18 school year with a pair of new hires. Josh Hayman has been selected as the new cross country/track and field coach while Eric Lee will now be in charge of the softball program. 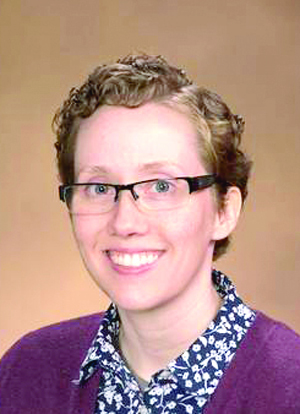 Hayman, a former distance runner at Syracuse University, has been a graduate assistant at Louisiana-Monroe. Louisburg High School freshman Jaheim Brown attempts a pass during last Thursday's home football game against the Franklinton Red Rams. 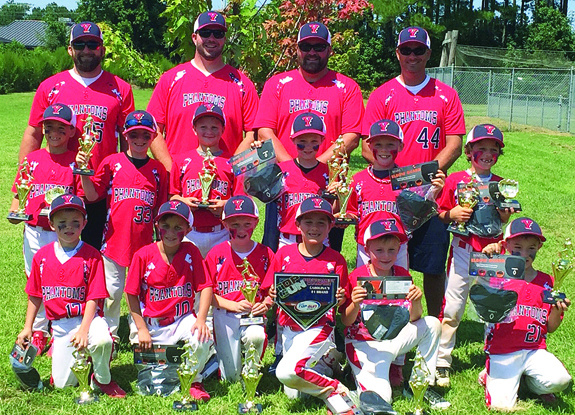 The 10-Under Youngsville Heat Baseball Team won its first fall tournament of the season on Aug. 26-27 in Rocky Mount. The club won four games, including a 17-7 decision over the Carolina Mud Dawgs in the championship contest. 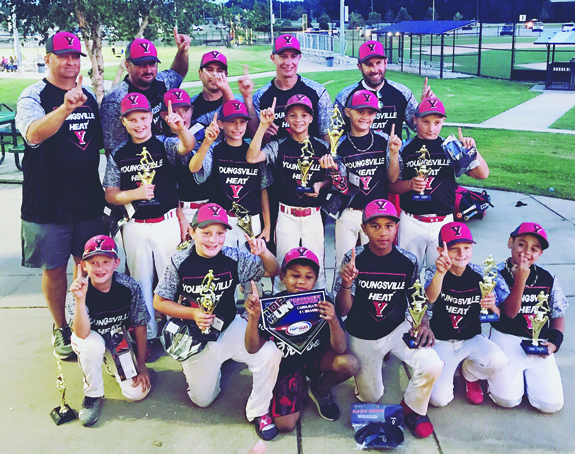 The new 8-Under Youngsville Phantoms Baseball Team won its first fall tournament of the season at the Top Gun Arm Guards Championships on Aug. 26-27 in Snow Hill. 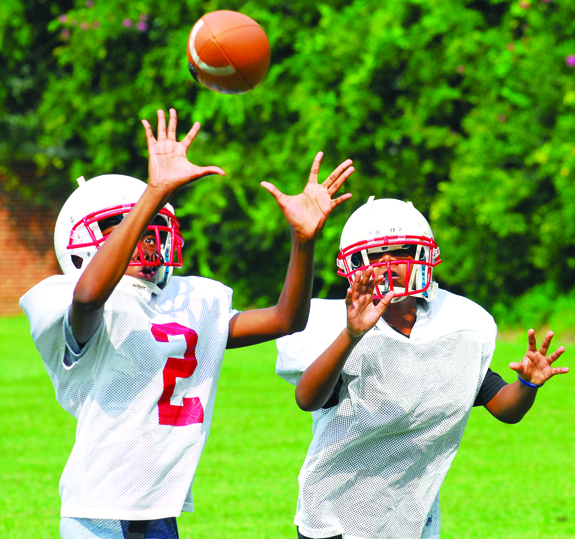 Franklinton Middle School's Deandre Glasco (left) goes up for a reception while a teammate defends during a recent football practice session on the FMS campus. 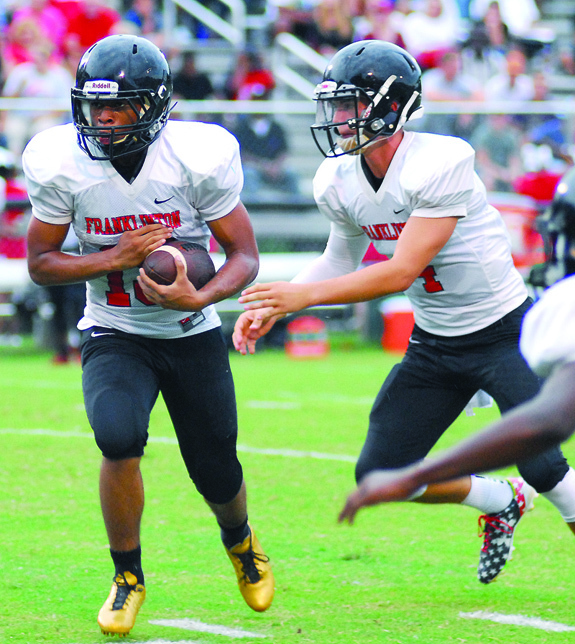 Franklinton's Raven Cardwell (left) takes a handoff from quarterback Scott Schriver during last Thursday's road conquest against Louisburg. Franklin County Arts Council's Writer's Guild organizers are looking forward to their Fall Writers Day Retreat on Nov. 18. The retreat will be held at Rolling View Community building, a part of Falls Lake Recreational Park, from 9 a.m. until 5 p.m. They will welcome participants with coffee and donuts and a meet and greet on arrival. The day will include workshops, writing time, and readings all on the shore of the lake and surrounded by nature. LOUISBURG -- Tables will be set for the 4th Annual Dinner In The Meadow at Meadow Lane Farm on Sunday. Tickets are now available for the Dinner that endows The Leonard-Mobley Small Farms Fund, a $5,000 grant established to assist with projects such as development or expansion of new sources of agricultural income on the recipient's farm. 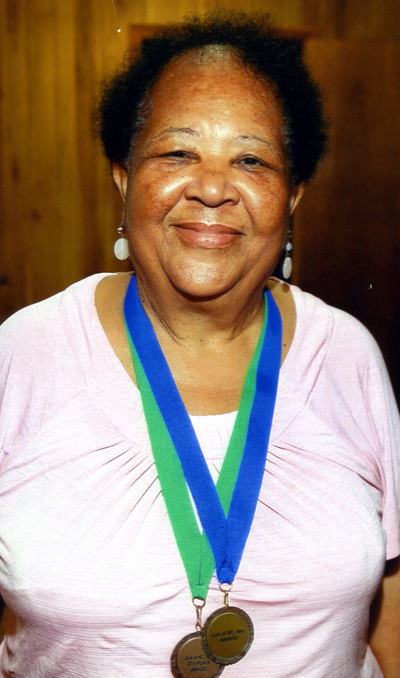 Current residents, former residents, family members and friends of the neighborhood known as "Blacktown" came together recently for a community gathering held on the grounds of the late Walter and Ada Mae Pettiford homesite, at 306 Averitte Street in Louisburg. More than 100 people from across North Carolina and out-of-state former residents were present. The Paralegal Technology program at Vance-Granville Community College will host a panel discussion on careers in the paralegal field on Wednesday, Oct. 11, from 10 a.m. until noon in Building 4 on the college's Franklin County Campus, where the program is based. During the discussion, graduates of the VGCC Paralegal Technology program, attorneys, and the assistant director of the North Carolina State Bar Board of Paralegal Certification will discuss the expectations and various roles of paralegals in the workplace, ethics, confidentiality, employability and paralegal certification. HENDERSON -- The Vance-Granville Community College Culinary Arts program has changed the way it schedules core courses this semester. Culinary courses will now be taught in eight-week sessions rather than in the traditional 16-week semester format. 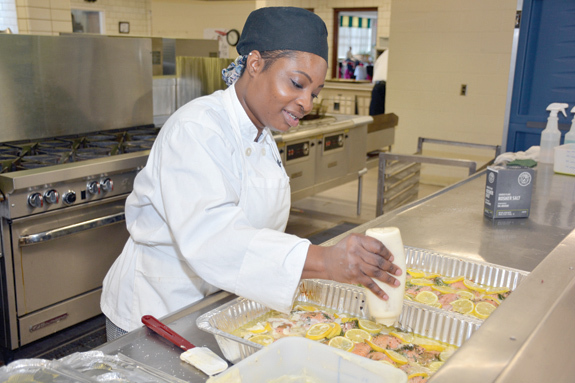 "One benefit of the eight-week format is that our students will have more concentrated time in each specific lab," explained VGCC Culinary Arts Program Head/instructor Chef Teresa Davis. 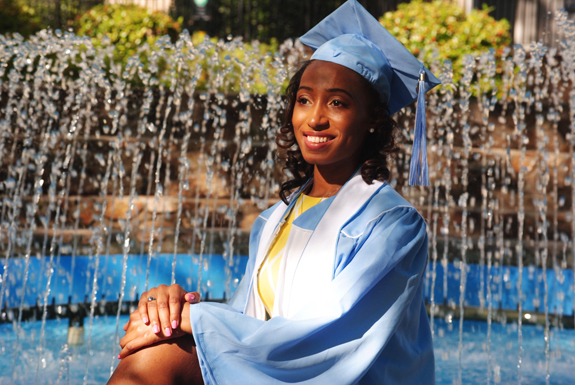 HOLLISTER - Jazmin Alston, a 2017 UNC graduate and Alston-Pleasants Scholar, has been awarded an Alston-Pleasants Post-Graduate Scholars Fund scholarship for graduate studies in the East Carolina University Master of Arts and Certificate of Advanced Study in School Psychology Program. Franklin County Clerk of Court Patricia Chastain is part of the group that oversees the scholarship program. LOUISBURG -- The Franklin County Firefighters Association is set to host a 9/11 ceremony this coming Monday -- weather permitting. It will mark the 16th anniversary of the Sept. 11, 2001 terrorist attacks that resulted in the deaths of thousands, bringing down the World Trade Center towers in New York, a crashed plane into the Pentagon and forced another plane crash in Pennsylvania. LAKE ROYALE -- The gated community has a new police chief in place -- the third leader in about two and a half years. Joseph Goodrow, who joined the department in July 2016 and became chief in December 2016 -- replacing Charles Ferrell -- resigned on Aug. 25. In an interview shortly after he was made acting chief, Goodrow said he had a five-year plan to imbue his fellow officers with the skills, ability and wisdom he picked up through 20 years in the Marine Corps and another 19 years in law enforcement. LOUISBURG -- Franklin County commissioners said now is the time for its vehicle service agreement to get a tune-up. Ten years ago, the county changed its purchasing and service policy so that all service contracts were put out to bid -- placing an emphasis on the county's vehicle service contract. 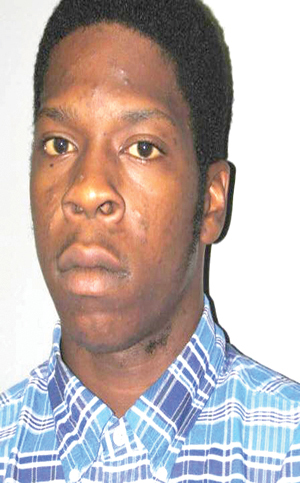 Franklin County sheriff's deputies responded to a weekend shooting in Ingleside, but the victim and witnesses said the matter was accidental. Deputies responded to 10 Cavalier Lane to find a man suffering from a gunshot wound the evening of Sept. 3. Witnesses and the victim said the man was at a cookout at the residence and reached for a can opener in his pocket, grabbing the weapons instead, and it discharged. Meeting in an unusual noon Tuesday session, the Louisburg Town Council voted unanimously to support an application that, if approved, would provide $70,000 for a company wanting to locate in Louisburg. Impact Healthcare, P.A., has pledged to create seven full-time jobs in Louisburg and is seeking a Building Reuse Grant through the North Carolina Department of Commerce to make that happen. LOUISBURG -- A Franklin County woman injured in a suspected road-rage crash that killed a toddler has filed a lawsuit against those investigators allege were responsible for the wreck. The State Highway Patrol charged Chastity C. Stamper, 37, of Hollister, with misdemeanor death by motor vehicle and improper passing for her role in the Aug. 4 wreck that killed 1-year-old Michelle Zavala. Members of the Franklin County Ushers Union attended the 92nd Annual Session of the Interdenominational Usher Association of North Carolina, Inc., held in Greensboro at St. Stephens United Church of Christ. 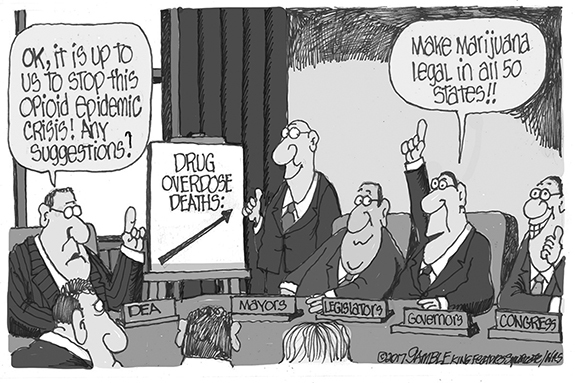 The session began on Friday, Aug. 11, with the opening ceremony and ended on Sunday, Aug. 13, after the worship service.